Youtuber Zac Alsop created two fake credentials -- a media pass and a promoter's pass -- in Photoshop and crew-hopped until he ended up right by Dana White. Not to be sated, however, Alsop took it a step further and eventually rolled out with McGregor's posse. In his video, Alsop detailed how he was getting into the presser. Perhaps the craziest part is that he did all of this with two days to prepare. In order to get in anywhere, he used the tried and true method of "get behind someone bigger than you." Alsop meandered aimlessly through the building until he eventually was sitting ringside for the presser, where he talked to some rather eccentric Irish McGregor fans. 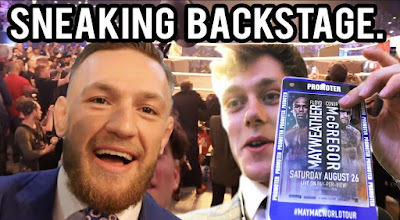 After it was over, he ended up right next to McGregor himself by following a pair of Mayweather cameramen.